Something unique and delicious were delivered at home last night - and I had to check the guy who handed me the boxes just to make sure he is a pizza delivery guy, and not the Mr. Prince Charming which cupid has sent. I opened the boxes and these what greeted me - heart-shaped pizzas!!! He said it was sent by an Angel (Angel's Pizza). Valentine's came early! Click Read More to know more about these heart-shaped pizzas! It took me probably 10 minutes before I finally put down the phone and took a slice. I was expecting it to be a little less flavorful and crunchy-chewy after I wasted a couple of minutes adoring them through my camera. You know how some pizzas are only good when they were fresh from the oven (or freshly delivered). Surprisingly, the crust remained good. They were sliced criss-crossed, giving it small slices on the edges part and squares in the inner part. I first tried the Fancy Aloha Flavor and it is just all toppings - bacon, ham, pineapple, mushroom, green pepper, mozzarella cheese, black olives. It is fancy indeed! It is their little twist of the favorite Hawaiian Pizza flavor. The All Meat Pizza is also a great surprise! It is as if the pie man did not waste any space in the pan and covered it with toppings. I can ask for another pan to top it in my slice to make a sandwich! What do we got? Pepperoni, bacon, ham, chorizo, beef topped with mozzarella cheese. Here it is, looking at you! 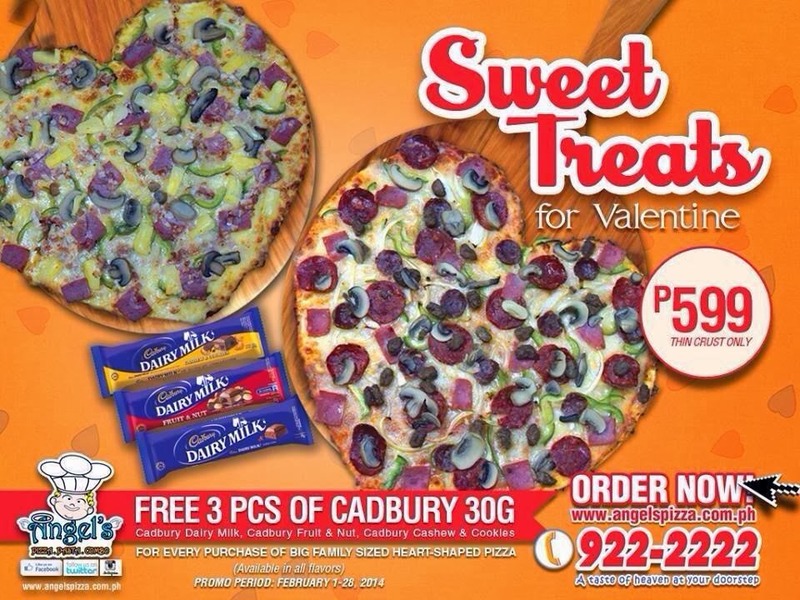 I thought Angel's Pizza is like an ordinary pizza and its only selling point is the heart-shaped pizzas (just like the popular pizza delivery store that offers really big pan pizza - which is just big - a real disappointment). My mom who is not much fan of pizzas was pleasantly surprised with Angel's Pizza. She felt that she finished half of the Fancy Aloha ;) She kept asking me how much it costs. I had a feeling then she would order another pan for herself. Can I also share that I love the hot sauce that goes with the pizza? I love hot sauce and this one meets my hot sauce standards. I am keeping the Angel's Pizza number just in case we want to order pizza for movie marathon nights - the kind of quality bonding time I prefer more than going to restaurants to eat fancy meals during events such as Valentine's Day. If you are a guy who wants to impress your girl, send her a heart-shaped pizza from Angel's Pizza. If you are a girl, save your guy the trouble of doing restaurant reservations and just dial 922-2222. Angel's Pizza also delivers pasta, calzone and other side dishes. I will try those offerings next time. Check out http://www.angelspizza.com.ph/ for the menu. As for the delivery, they do deliver on time. I was advised by an "angel" that something would be delivered at home by 7:00 PM, and Mr. Delivery Guy just came on time. Take advantage of this Sweet Treats Promo! What do you think of the heart-shaped pizza? Have you tried Angel's Pizza?